Bullish or falling wedge chart pattern is formed with two downward sloping straight lines tend to intersect each other at a point. The downward sloping top of the wedge holds the resistance points, which are going lower and lower, and the downward sloping bottom line holds the support points, which are also going lower and lower. 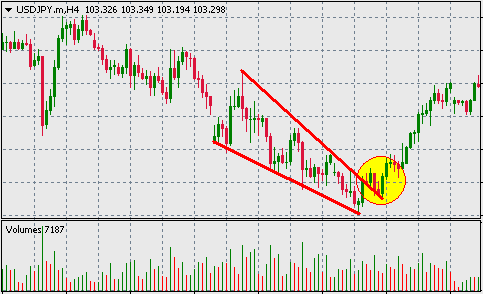 When the falling wedge chart pattern is formed, the traders should wait for the bullish break out of the patten across the top trend line. It is very natural that the bullish trend will be slower while crossing the previous resistance levels. We can see the bullish trend become weaker while crossing the resistance levels. The profit target for an order placed with falling or bullish wedge pattern formation should be placed on the suitable resistance level, considering the other resistance levels.